The Brutale 675 established a new technical and styling concept, showing for the first time how outstanding performance, exemplary design and extraordinary handling could be combined with race-grade size and weight. The Brutale 800 RR reaffirms the winning intuition that lies at the core of the project. This version, in fact, boosts performance even further to achieve 140 hp at 13,100 rpm and 86 Nm of torque at 10,100 rpm in a package that includes a refined chassis set-up and an improvement on the already rich set of standard features. Faithfulness to the original lines shows just how relevant the Brutale project is today: the compact, smoothly integrated volumes, the perfect proportions, the attention to the tiniest details and consistency with renowned MV Agusta brand styling make this naked an unsurpassed example of Italian creativity. 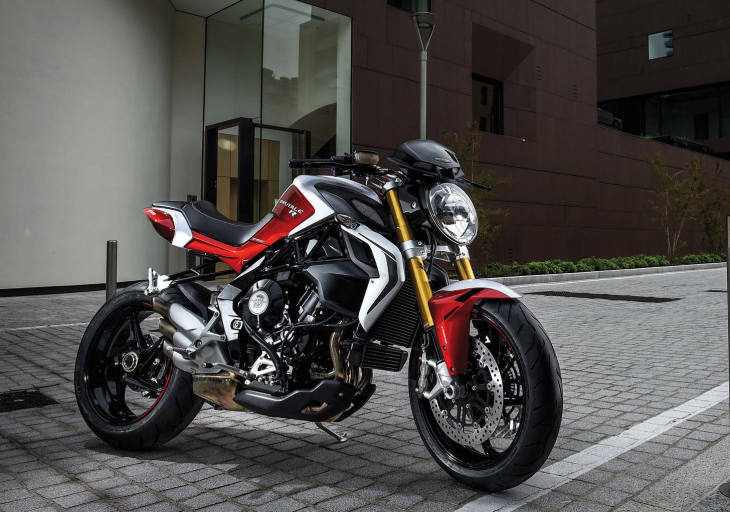 Some features make the Brutale 800 RR instantly recognisable from an aesthetic viewpoint too, such as the red-painted cylinder head which contrasts beautifully with the solid black of the compact, in-line three cylinder engine. Or the new finish of the Marzocchi fork, which has also benefited from functional upgrades, and now sports an “aged gold” colour. The look and shape of the seat have been changed to improve comfort and ergonomics for both rider and passenger while the eye-catching stitching emphasises the attention to detail that is so fundamental to MV Agusta corporate culture. The LED tail light has a brand new diffusion system that suffuses the light evenly, achieving the dual goal of enhanced bike visibility – and, consequently, improved passive safety – and even better rear-end styling. The wheels, made of cast aluminium alloy, now feature a new five-spoke design. The colour schemes are specific: the Rosso Shock Perlato/Bianco Ice Perlato (Pearl Shock Red/Pearl Ice White) combination is reminiscent of traditional MV Agusta colours, while the elegant Grigio Avio Metallizzato/Nero Carbonio Metallizzato (Metallic Aviation Grey/Metallic Carbon Black) provides an alternative for those with ‘darker’ tastes. The graphics are consistent with those of the Brutale family but in this case they highlight the fact that this model belongs to the exclusive RR group (i.e. the flagship versions of the Italian manufacturer’s models). MVICS 2.0: this abbreviation embodies and encapsulates, just like the RR tag, the superb outcome of the ambitious development route taken by MV Agusta right from the beginning of the 3-cylinder project. The initial choice of a technological partner just breaking into the motorcycle segment but with extensive experience in the automotive world was daring and required additional effort; the outcome, though, was the unmatched performance the 2.0 configuration of the on-board electronics now gives MV Agusta customers. In fact, the MVICS 2.0 (Motor&Vehicle Integrated Control System) platform takes an approach based on precision, flexibility and personalisation. Precision, because the three standard factory-set mappings (Sport, Normal and Rain) allow the rider to manage torque precisely and consequently ensure smooth output at low revs, essential, for example, in the city or on slippery surfaces. At the same time they let the rider unleash the feisty sports spirit of the threecylinder, especially in the 140 hp RR configuration. Flexibility: the use of models with very different characteristics – from the versatile Turismo Veloce to the supersport F3 800, through to the vivacious Dragster 800 RR – demonstrates just how the system was designed to provide a modular combination of characteristics. Personalisation: the Custom mapping allows the rider to adjust fundamental parameters such as engine response, rev limiter, engine torque response, throttle sensitivity and engine braking. All easily done in just a few seconds via the handlebar controls and without any need for specialised know-how. Rapid upshifting on hills, without the clutch? No problem, thanks to the new Quickshifter EAS 2.0 that caters to the Brutale 800 RR’s sports vocation. Alongside the Dragster 800 RR, this is the first model in the segment to feature the electronically assisted downshifter, offering yet further evidence of MV Augusta’s constant technological progress. Completing this picture of excellence is the mechanical slipper clutch , highly useful when downshifting as you go into a bend on the road or during lastsecond braking on the track. Last but not least comes traction control with 8-level sensitivity (which can also be disengaged). This system, which acts on throttle body opening, ignition advance and injection has now been developed even further and features functional logic specifically designed for the Brutale 800 RR. With a 1,380 mm wheelbase and 95 mm trail, the Brutale 800 RR allows for fast, agile changes of direction. The main structure of the frame consists of ALS tubular steel with outstanding metallurgical qualities, welded in such a way as to obtain excellent bending and torsion strength while keeping the weight low. Two aluminium alloy plates complete the frame: they constitute the pivotal point of the single-sided swingarm, also in aluminium alloy, another characterising element of the chassis. 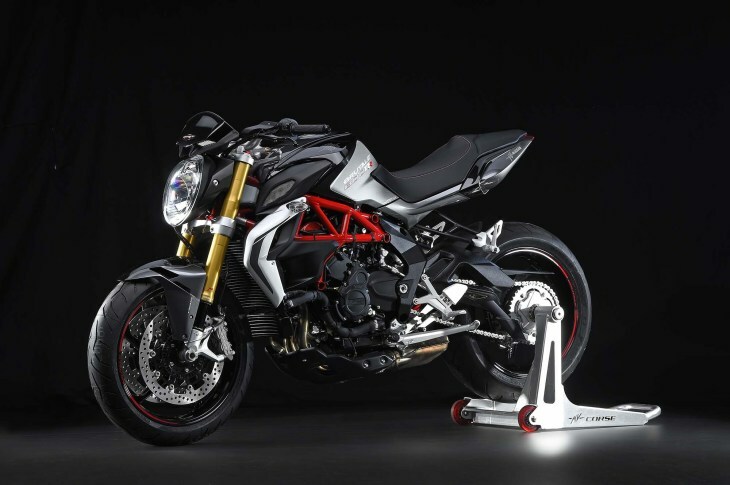 The quality of the suspension has a decisive impact on effective performance and riding pleasure: this is why MV Agusta chose shock absorption equipment of unrivalled smoothness and adjustment potential for its Brutale 800 RR. On the front end the enhanced performance meant that a steering damper had to be fitted; designed by CRC, it features adjustable response. The new aluminium 43 mm diameter Marzocchi upside-down fork is lighter than the unit fitted on previous Brutale models and is easily recognisable on account of the “aged gold” anodizing: other features deserving of mention include the DLC (Diamond Like Carbon) coating which increases surface hardness – and, therefore, the life of the part – while making stanchion travel even smoother. The fork features an external adjustment mechanism that is separate from the hydraulic brake in rebound and compression; it is also possible to modify the pre-load. The Sachs monoshock provides the same adjustments. Wheel travel is 125 mm on both axles. ABS as standard and exceptional slowing power: these were the foundations on which the braking system was developed, a system that employs a pair of large-diameter (320 mm) steel discs at the front, gripped by Brembo 4-piston callipers (diameter 32 mm ) mounted radially on the fork bottom. The rear steel disc has a diameter of 220 mm and is coupled with a Brembo 2-piston calliper (diameter 34 mm). The characteristics of the Bosch 9 Plus ABS system with RLM (Rear wheel Lift-Up Mitigation) are evident in its name; the operating logic, working alongside the refined anti-locking system, limits the risk of the rear end lifting up during braking. The rims, specifically designed for this model, feature a vortex look, with five spokes modelled from cast aluminium alloy. The 3.5” front wheel channel mounts the Pirelli DIABLO ROSSO II 120/70-ZR17 tyre; on the rear the channel measures 5.5” and mounts a 180/55-ZR17. 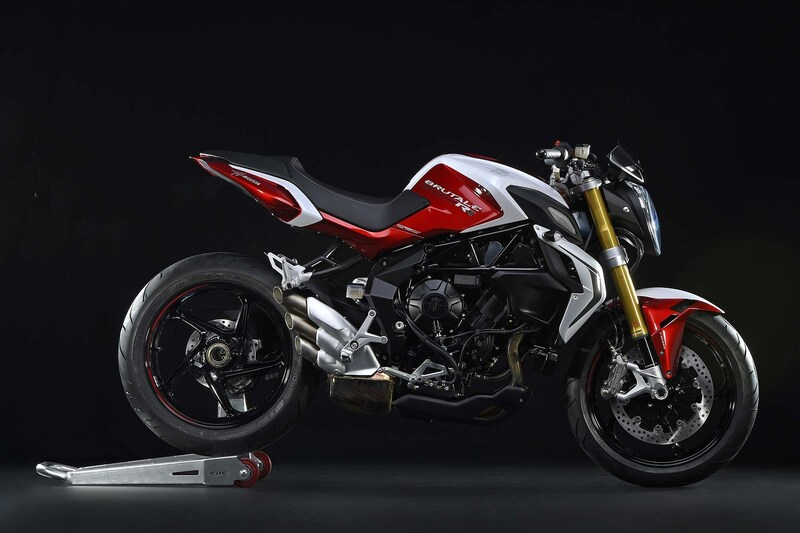 Considered the most advanced in-line three-cylinder in production anywhere in the world, the engine mounted on the MV Agusta Brutale 800 RR is a concentrate of performance, compactness, low weight (52 kg) and cuttingedge technological solutions that strengthen its standing as segment leader. Contrary to what one might think looking at the technical data, this version of the MV Agusta is not derived from the power unit mounted on the F3 800 (148 hp maximum power), but from the Brutale 800 three-cylinder engine with the added benefit of some important refinements. More specifically, this, the most powerful configuration manufactured to date (140 hp at 13,100 rpm) – a set-up shared with the Brutale 800 Dragster RR – is partially the result of the new airbox design which required a modification to the fuel tank (without affecting its 16.6 litre fuel capacity): imperceptible from the outside, the new shape enhanced performance and provided the housing for the bank of “high” injectors that have throttle bodies with a diameter of 50 mm. These new features, in fact, extend to the electronic injection system, centred on the Eldor EM2.0 engine ECU and the Mikuni Full Ride-By-Wire throttle body: there are now two injectors per cylinder, as opposed to the single one on the other Brutale models (with the exception of the Brutale 800 Dragster RR), making a total of six injectors. The goal? To provide smooth, progressive output at low and medium rpm without sacrificing power at peak revs. With 140 hp at 13,100 rpm and 86 Nm (8.77 kgm) of torque at 10,100 rpm, this engine allows the Brutale 800 RR to compete even with larger-displacement power units, thanks also to its exceptional power-to-weight ratio. The new hydraulic chain tensioner, which simultaneously improves both noise and engine reliability, works alongside exclusive and refined technical solutions such as the racing style counterrotating crankshaft, ideal for reducing inertia during changes of direction, and the removable 6-speed gearbox – designed for those who want to use the bike on the track and adapt it to the characteristics of the different circuits. It’s an MV, so as always the real question is whether the usual glitchy fueling and other lack-of-R&D refinement issues have been properly addressed. Hey, Zamfir plays a mean set of pipes! 86 Nm sounds mighty impressive for an 800, till I did the conversion, 63 ft. lbs. Still impressive but the Nm sounds better for someone who can’t do the conversion in their head, and I’m sure it’s faster than I am by a wide margin. Not practical by a long shot, but grocery runs isn’t what they were going for. Why all the worry about MV’s dealer network..? This is not a bike you’re going to tour on, or ride all that far from where you live or bought it. Parts may be slow to get, but folks who can afford to buy this beauty more than likely will have another bike to ride while they’re waiting. This machine does not come under the heading of a “practical purchase”. Neither is a Ferrari or a Maserati. If your one of those fortunate ones who appreciate the style and quality of the RR then buy it, enjoy it, and stop the pointless nod to misplaced practicality and worry. A: warranty fulfilment. Magnuson-Moss circa ’75. I think it is a fantastic bike. I love the look and as compared to other bikes in this class hits the right bench marks in performance. In the resent surge of offerings in “middle weight” nakeds, some aspects or components get compromised, in order to meet a price point, that does not seem to be the case with this bike. I always find it amusing that it doesn’t cost ant more to design a nice looking bike than an ugly bike. Too bad machines like the Suzuki Gladius are so ugly when they could just hire a high-dollar designer to make it look like a rolling piece of art. The early Yamaha R1’s are a good example of a beautiful bike at a reasonable price. I think from the side this looks very much like a Gladius with a different pipe. I was just toggling back and forth between the two and the similarities are astonishing. wait, how does this jive with your opening sentence…? I’m sure these are a blast to ride, too bad for me at 6’0″ my knees hit the bizarre tank “wings”. I suppose they add to tank volume a bit. Otherwise, styling wise, these are prettier than most in this class. I could still live without the radiator shrouds though and the engine in the larger Brutale looks better to me in silver with the red valve cover. Not everything has to be black. It’s called contrast. Hopefully they’ve fixed the clutch and throttle issues reported on the last version. I agree with Tim that MV’s are sort of jewel-like up close that most other makes aren’t. No, Harley’s and Harley clones are fat and ugly. Some Japanese sport and nakeds are ugly. Italians don’t do ugly. That said, this is not as attractive as the original Brutale. I know the engine is a jewel. There are probably high quality components. Even attention to detail. But for me it doesn’t look right in whole. Just let your eyes focus on the engine. There are too many lines and shapes and pipes and stupid angular bodywork with even more distracting paint schemes. Someone else commented correctly. Transformers. Every bike manufacturer wants their line to look like a transformer toy. I should also add that you need to see an MV up close, and see the little details to fully appreciate them. I agree, it’s a jewel, no matter what you ride or like. MV is only one. And every-one is beautiful! the original Cagiva V raptor (remember that one?) used to look pedestrian but once you get close you start noticing all the details, e.g. the slimness of the 999 that’s not obvious on photos. I guess that old “Zamfir” feller is still styling them exhausts over at MV. OK, it’s beautiful. It’s got the right balance of all the technical goodies and design cues. The dilemma will arise when my wife says, “It’s me or the Brutale,” and I’ll be undecided…. Just lay down the ground rules up front. Her short little red&white dress is enough to get anyone’s attention. Fantastic looking bikes, but unfortunately for many of us, a dribbly dealer network. But at least they have a dealer network (no matter how small). Benelli has great looking and now performing bikes also, and NO US dealer network– shame on both counts. Question, new machines should not give you problems… what if you buy the machine and perform the maintenance by yourself, you can always import the parts from the old continent right? messy… maybe. Yes I know, for example my mother’s pilot had a lot of recalls and fixes were performed for a good price instead of trying to figure out what’s happening to the machine by yourself, but that’s a 90k miles car, you can always sell the machine and buy next model in a couple of years right? it only begs the question, if you’re tending to ALL that…? then when are you RIDING the friggin’ thing…? or is exterior decorating the goal…? I mean if it is, no slate. just saying; if you want the machine that much to risk not having a dealer close. hopefully all the time, the motorcycle is new… of course you can always get a lemon and spend some hundred hours messing with it. Wow! This is as close to my ultimate dream streetfighter there is now! Nice machine. More unobtanium. But if you’ve been saving or just got that nice starting job with the big bucks, looks goood. The classic MV pipes. Rolling art.